Former England captain Michael Vaughan says he would drop fast bowler Stuart Broad for England's second Test match against Pakistan at Headingley. 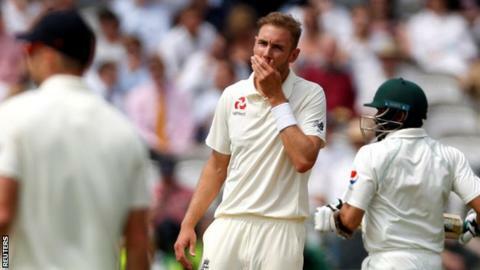 England lost the first Test of a home summer for the first time in 23 years when they suffered a nine-wicket defeat by Pakistan at Lord's on Sunday. Vaughan believes the England team are too comfortable and need "ruffling". "If England want to play Chris Woakes on Friday, I'd make the tough call that Broad doesn't play," he told 5 live. "Teams need a shake-up. I don't want England to go to Headingley on Friday and Mark Wood to be the one left out. It's easy to bring in Chris Woakes for Wood. "But for me, Wood plays. What's he done wrong? He got 2-74 [against Pakistan]. The tactics were wrong for his style of bowling and that's just the direction of the team and the captain." A collapse of four wickets for six runs on the fourth day at Lord's left England 242 all out and Pakistan chasing only 64 to win - which they achieved with 90 minutes left in the day. Pakistan will now have the opportunity to seal their first series win in England since 1996 when the second and final Test begins at Headingley on Friday. "England haven't been winning for a long time," Vaughan said on The Tuffers and Vaughan Cricket Show. "They just keep going with the same old every single week. This is just a think tank to drop Broad or James Anderson, and I hope people within the team and the management think 'could it make a just a little difference?' You never know. "Are they winning with them at the moment? Are they bowling as well as they were three of four years ago? No. Should Chris Woakes be in the side? Well, he has a great record in English conditions." Broad and Anderson have been England's main strike bowlers for the last 10 years, with 252 caps and 945 wickets between them. Wood has played 11 Tests and Woakes 23. "These are things I'm hoping the side are actually thinking about. England have lost eight games in the last 15 Test matches with that team, which has been the same eight or nine week in week out. You never know, it might ruffle a feather and change mentality and that's what the England Test team need. "They've got all the skill and talent on paper, but I want to see more in terms of their mentality of how to play Test cricket. It might trigger the team into thinking none of us are safe. I think it's too comfortable." England's batting: Why is it so bad and what can they do about it? Read more on England's batting: Why is it so bad and what can they do about it?